The other significant change I made to the sketch was to adapt the 12×12 design to fit a 9×12 page, a size I have been loving after many years of creating 12×12 layouts. I cut a strip of the label patterned paper and stamped a word in each label and then cut and stitched some ticket shapes which added a touch of bold color. The lightning motif represented the quick action, and the cork phrase was the final touch, an unexpectedly fitting title. Remember when working with a sketch, the layout gives a starting place for designing a layout. From there, you can adapt and modify the design to suit your project while keeping the effectiveness of the composition intact. This leads to a project that is uniquely yours every time! How do you use sketches in your design process? Do you find sketches easy or tricky to work with when creating a layout? I would love to hear your thoughts in the comments below. The layout itself came together rather quickly. I used Studio Calico Film Club kits which complemented the blues and oranges in the photo. When making design choices, I often consider the effect of the lines and patterns. Here I chose stabilizing horizonal lines which express the calmness of the water and also balance the diagonal elements of the title and photo. I love how the journaling goes beyond describing the photo and tells a bigger story which is meaningful to me and my family. Without the Story Starter I doubt I would have come up with this idea and am grateful to have this recorded to look back on someday. Do you use Story Starters or journaling prompts in your creative process? I would love to hear what works for you! I had so much fun traveling down memory lane while creating this page, and was delighted when I saw my design featured on the cover of the May 2016 Spark Magazine. Unfortunately, I do not have more than a handful of photographs from my childhood. Although my parents took many photographs, they were mostly in the form of slides and not printed. Sadly, my parents both passed away in their forties, and I’m not sure what happened to the slides. Instead of photographs, I chose to convey the Eighties with colors, symbols, patterns, expressions, and stories. What are your favorites from the 1980s? Do you ever surprise yourself with the ease of how well a project comes together? My first design contribution for the February issue of Spark magazine at Simple Scrapper was just that sort of project. The photo captures how similar my son and husband are, and this was especially noticeable as they worked together on rebuilding a skateboard ramp. The design is based on a sketch template from Simple Scrapper’s Premium Membership. 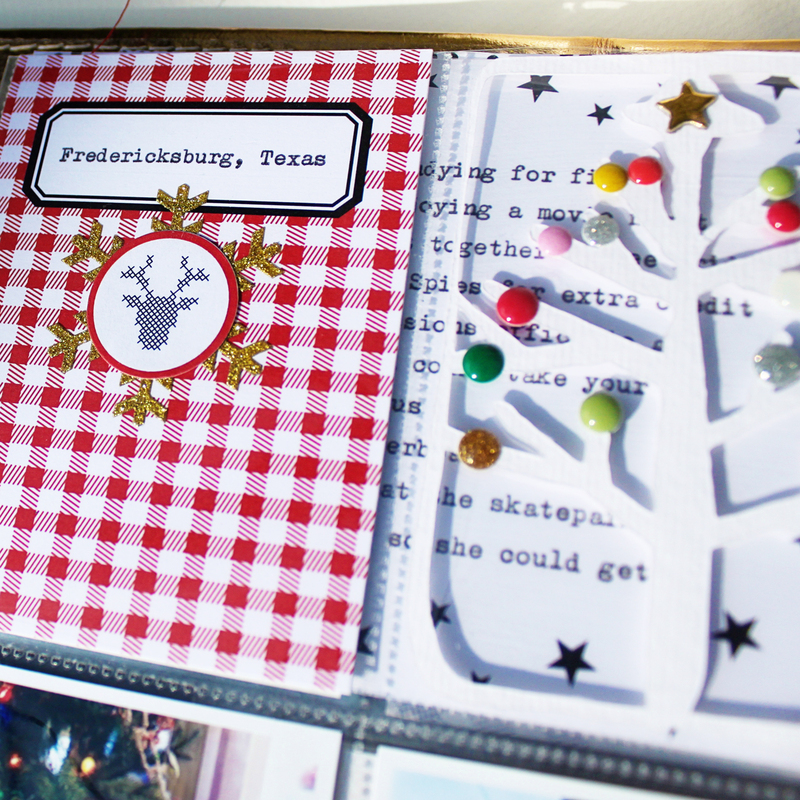 The supplies are from the Arendal scrapbooking kit from Studio Calico. I knew I wanted a graphic, masculine look for the page and immediately fell in love with that bold yellow paper designed by artist Ashley Goldberg. As my son pointed out to me, yellow and black are associated with construction which helped me to decide upon the color scheme. Adding this bright pop of color around the photo would give it emphasis. 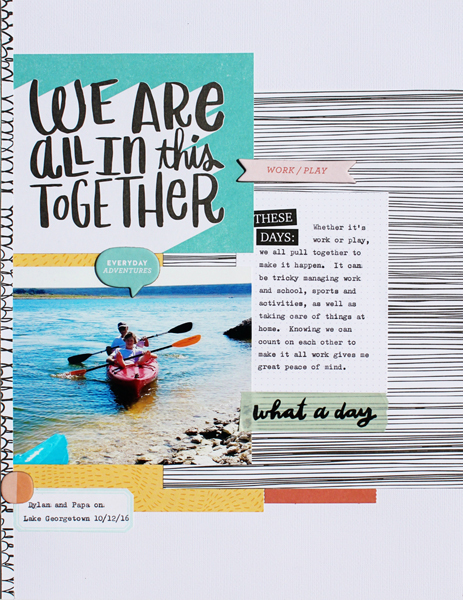 The Simple Scrapper sketch templates are actually layered templates which can be used to create digital pages. In fact, several of my fellow creative team members are digital designers. I am crazy about paper, and love moving it around and layering, adding and taking it away. This is all part of my creative process, and I enjoy creating most with tangible supplies. As a hybrid designer, I can use the sketch templates as more than a map for composition. For example, with this project I resized the layers in Photoshop Elements to fit a 9×12″ page and then dragged them onto a new canvas to cut them out in Silhouette Studio. This is one of my favorite ways to use a digital template. I then played with the layers until I liked the composition. Before I removed anything, I took a snapshot with my phone, something I often do so that I can recreate the layering by referring back to the picture. After lightly marking the space for journaling, I typed out the story using my favorite tool other than my MacBook Pro, my vintage typewriter, and then adhered the layers and added stitching, stamping, and simple embellishments. I attribute the ease of this project to having the starting place of a sketch template and am impressed with the volume of them available to Simple Scrapper’s premium members, almost 300! This layout makes me smile because it’s simple moments like these with my guys that I most want to remember. Do you use sketches and/or digital templates? If so, do you find them helpful, or is there a skill you would like to learn and add to your toolbox? I’d love to hear your thoughts in the comments below. The January book club (a new book club for memory keepers!) selection at Simple Scrapper was The Gifts of Imperfection by Brene Brown. This book happened to already be on my shelf, and anticipating the additional work demands January brings, I decided to skim to see what I would most like to reread. The chapter on creativity stood out to me. This topic has been on my mind lately as the elementary school in which I work is transitioning to become a visual and performing arts academy in the next school year. In addition, in taking on my new role as a creative team member, I’ve wondered about what it will be like to create on demand. Brene describes how on her journey toward wholehearted living, she discovered the importance of making time for creative expression. In fact, one of her key points is that we must carve out the time and prioritize creating. I connected with this as I have found in my own life that I am happier and more effective in all my roles when I set aside the time to create regularly. If I wait until the housework is caught up and I have a big block of time to myself, then it does not happen. Learning to embrace imperfection and a “just do it” approach has helped me learn to create in small chunks of time on most days. Another point which resonated with me is the importance of not comparing, something to which the author says we must bring continual mindfulness. I have found it is a fine line between gathering inspiration and comparing and even being thrown off course. In school, we as educators build in time for students to collaborate and engage with peer models, but then also require independent work for students to keep their eyes on their own papers, so to speak, to apply and synthesize their learning. Brene emphasizes that we all have something unique to express in the world and that terms such as best or worst do not apply when we cultivate our originality. The final point that stood out to me was the benefits of engaging with a creative community. The online world has opened several avenues for me to experience the inspiration a community of like-minded people brings. 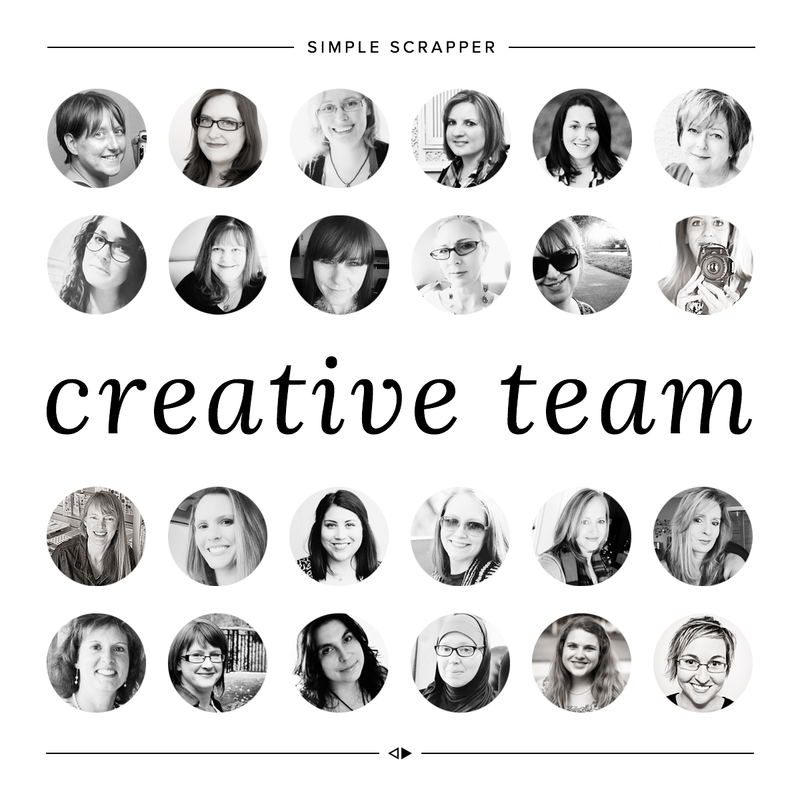 Some of my online homes have become Instagram, Studio Calico, and, of course, Simple Scrapper. In reflecting upon my creative process, I realized that creating with sketches, such as those which are released each month at Simple Scrapper, has resulted in some of my favorite layouts. In further reading about creativity, I came across the idea that we are creatures of habit and will tend to revert to whatever we have done successfully in the past. Limitations or requirements, such as a framework of a sketch, can lead to new solutions, or interpretations of a sketch. Tools such as sketches, prompts, and challenges can be a great way to stretch your self creatively. What are your creative goals for 2016? How can letting go of perfection and embracing your creativity help you get there? I’d love to hear your thoughts in the comments below, and if you are interested in learning more about the Simple Scrapper book club, please check it out. The February book selection is Better Than Before by Gretchen Rubin and is all about habits. Hope to see you there! 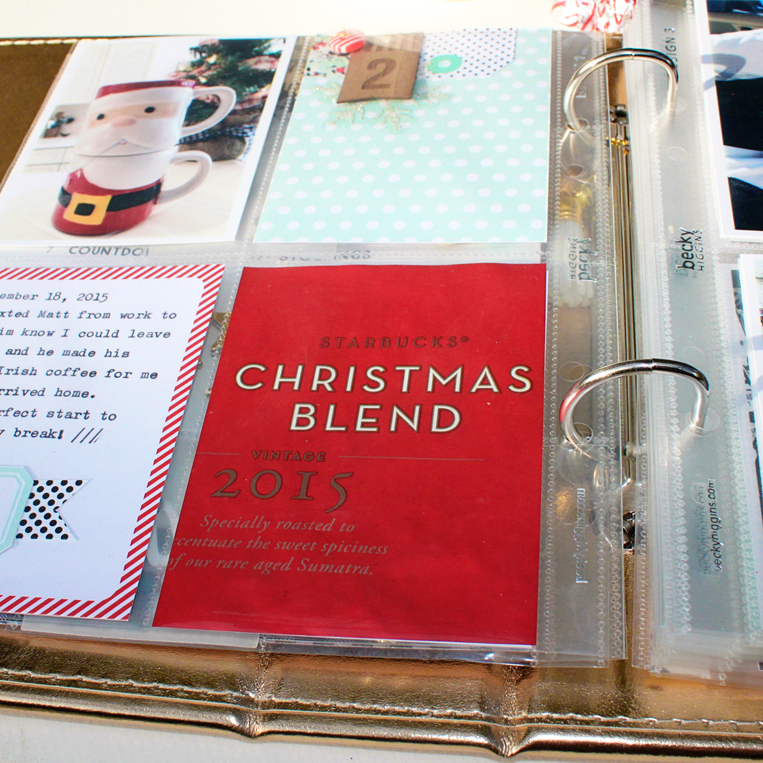 As 2015 draws to a close, I am sharing a few pages and thoughts from my December Details 2015 album. Although I had painted and embellished an album that I had left over from last year, when I received the gold Becky Higgins 6×8 album as part of the No Peeking add-on kit I purchased from Felicity Jane Studio, I knew I wanted to use this one. 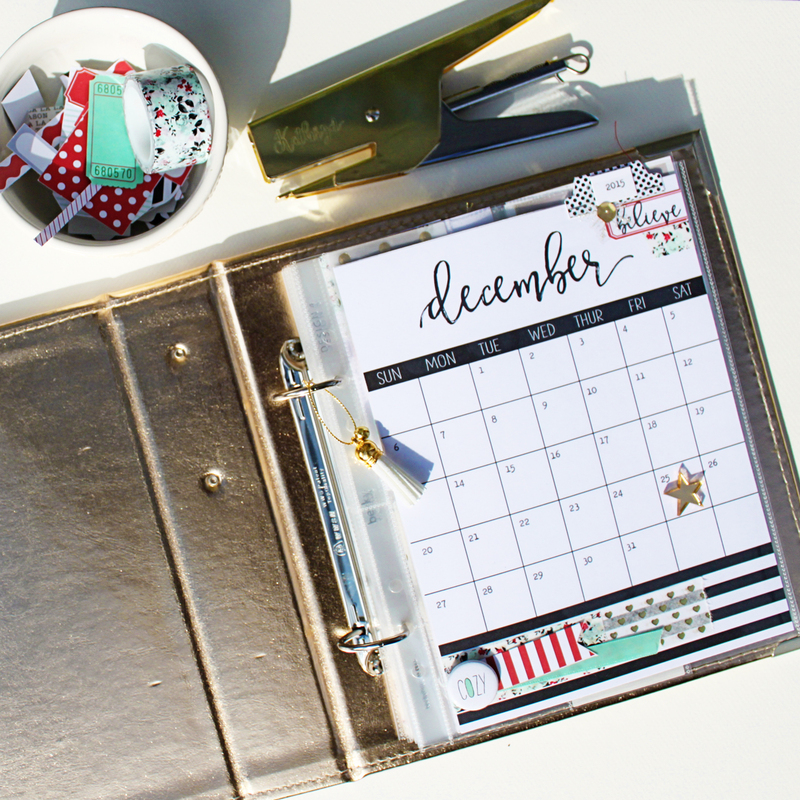 For the cover page, rather than clutter it up with details from this busy month, I typed the numbers for each day and after embellishing, added the gold star and flair badge to the outside of the page protector. In addition, I tied a tiny jingle bell and tassel with a shiny, gold cord as another tactile accent. In the past, I have made several failed attempts at completing a daily December album and have learned that this daily approach does not work for me in my current season of life. So this year, I changed my approach, and it’s been fun and breathed new life into my pages. 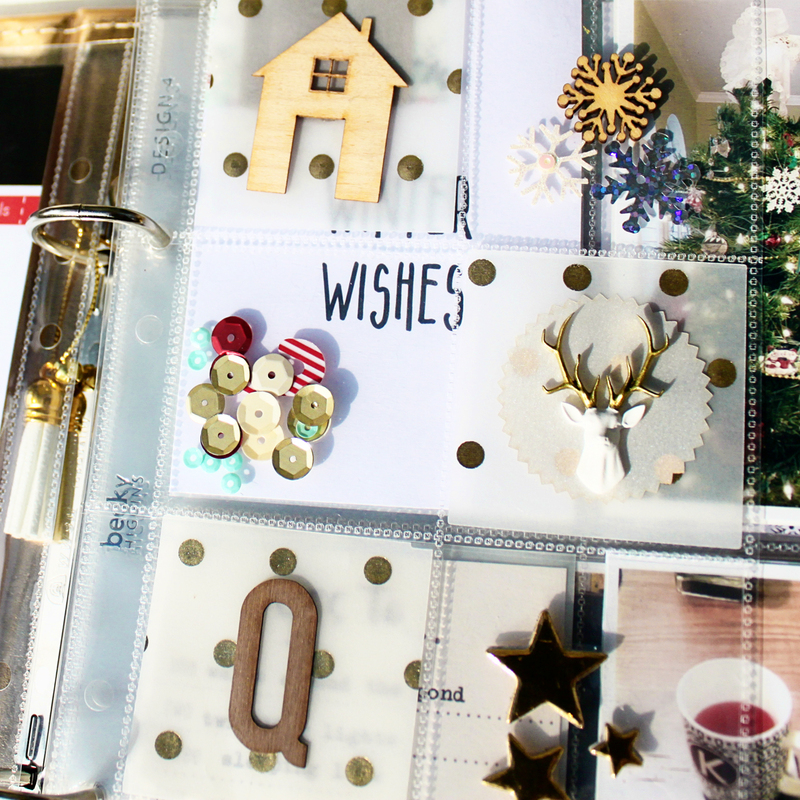 I am using the December Details numbered list of prompts available as a free download from Felicity Jane Studio. As a mom of a teenager, I appreciate that these prompts do not just apply to those with small children. 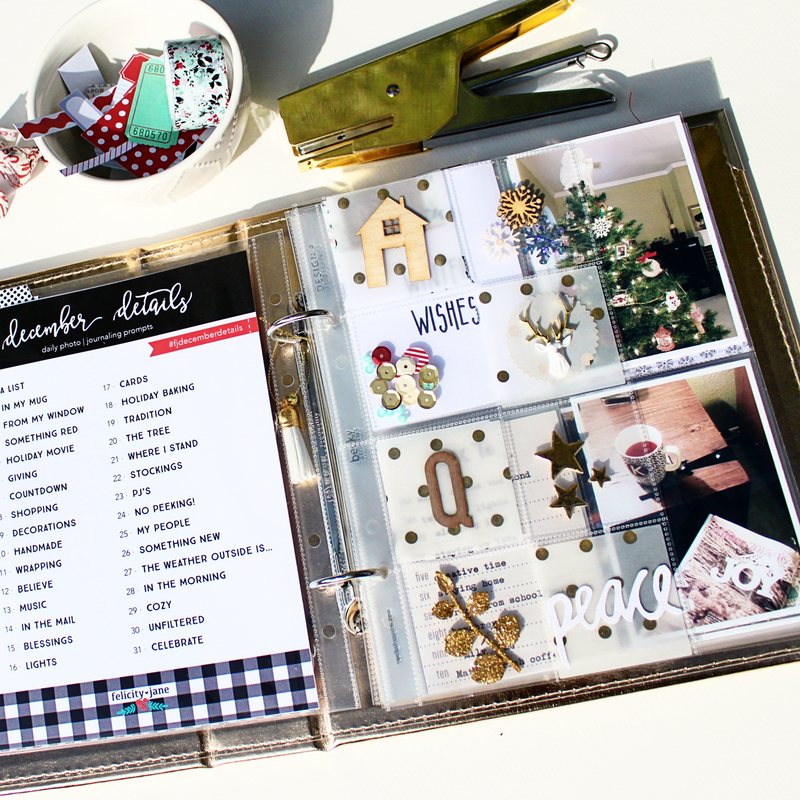 I included the list right in my album as a reference and then trimmed a page protector down to eight 2×2 squares and filled them with gold polka dot vellum and sparkly embellishments sealed with the Fuse tool. 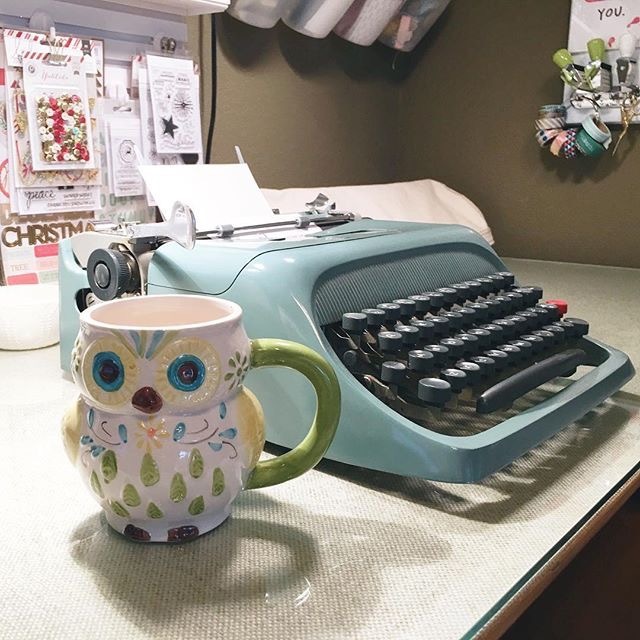 Another change I made this year is the use of my vintage typewriter to add journaling. I purchased this typewriter in the Spring, and it has become a tool I use each time I work on memory keeping projects. In my experience, it is faster than typing in PSE and printing and is also therapeutic to type on a real typewriter. I spent hours playing with a typewriter as a little girl so this has brought an element of play back to my scrapbooking. The prompt-based approach has encouraged me to take photos that I otherwise would not have taken. For example, I captured the view out my window of the neighbor’s holiday lights and a favorite red scarf for the “view from my window” and “something red” prompts. Another favorite detail is stitching with red thread. I don’t often change out my basic white thread in my sewing machine, but switching to the red thread for the holiday season will be a new tradition. 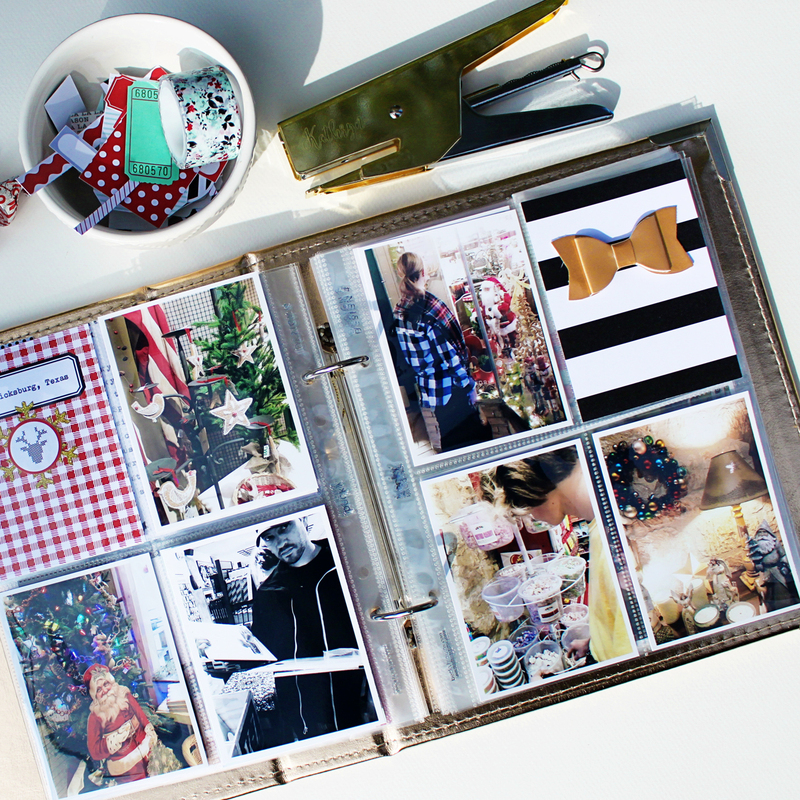 I love the look and added a few stitched details throughout my album to lend a consistency. As you can see in the above photo, school consumes much of our time in December around here. My son is a junior in high school and is taking AP and college courses through the community college. 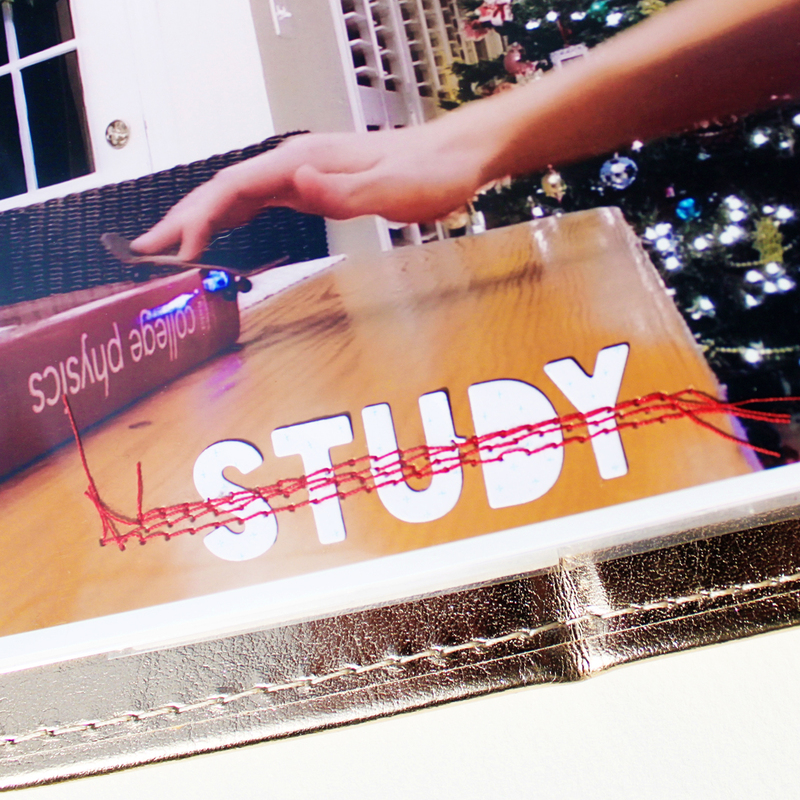 I captured one of the frequent study breaks, finger-boarding on the physics textbook. That’s one way to learn physics, I suppose! I stamped “Around Here” onto a label and typed some current tidbits about my son at this stage of his life. One of our favorite traditions is to drive out to Fredericksburg, Texas to enjoy window shopping and dinner. The red gingham card reflects the country atmosphere present in this small town. I trimmed down a page protector to two 3×4 slots to include more photos. I like the look of mixing color with black and white photos. The tree cut file above is from iheartstudio, and I cut it on watercolor paper and embellished it with enamel dots for ornaments. I love the way some of the typewritten journaling from the previous page shows through. Finally, creating and caffeine go together for me, so what would Christmas crafting be without Starbucks Christmas blend? I snipped the foil bag and wiped it clean to include in the album. As this year ends, I want to wish you a Happy New Year! May good things come your way in 2016. 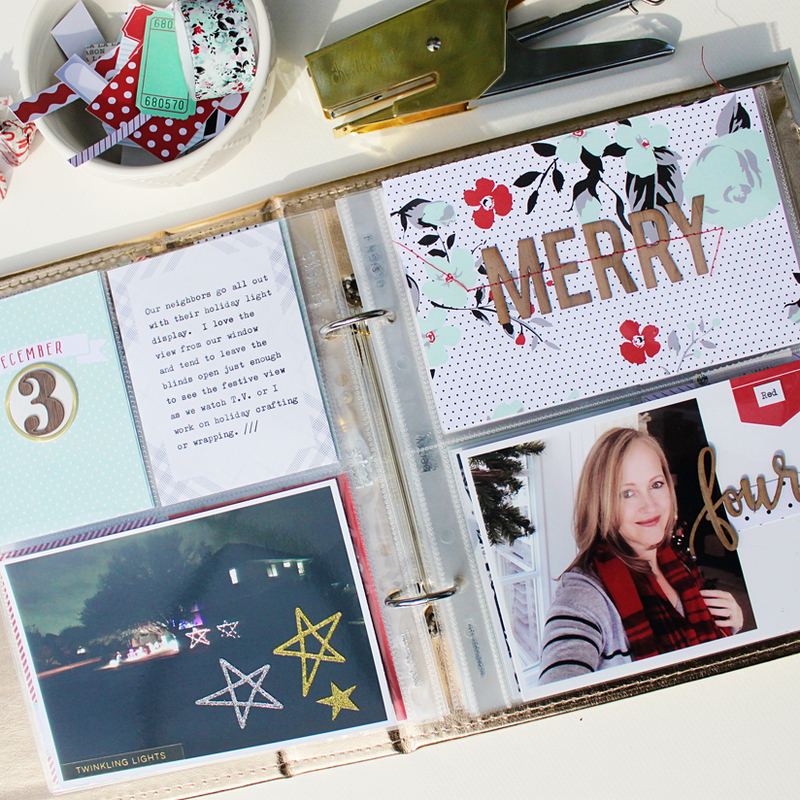 As I have experimented with this blog since beginning it back in the Spring, I have learned that I enjoy interacting with the Scrapbooking community. My plans going forward into 2016 include monthly creative team posts with Simple Scrapper projects sprinkled with regular Quick Tips which I have begun collecting to share. I share regularly on Instagram as well, and would love to interact with you there. 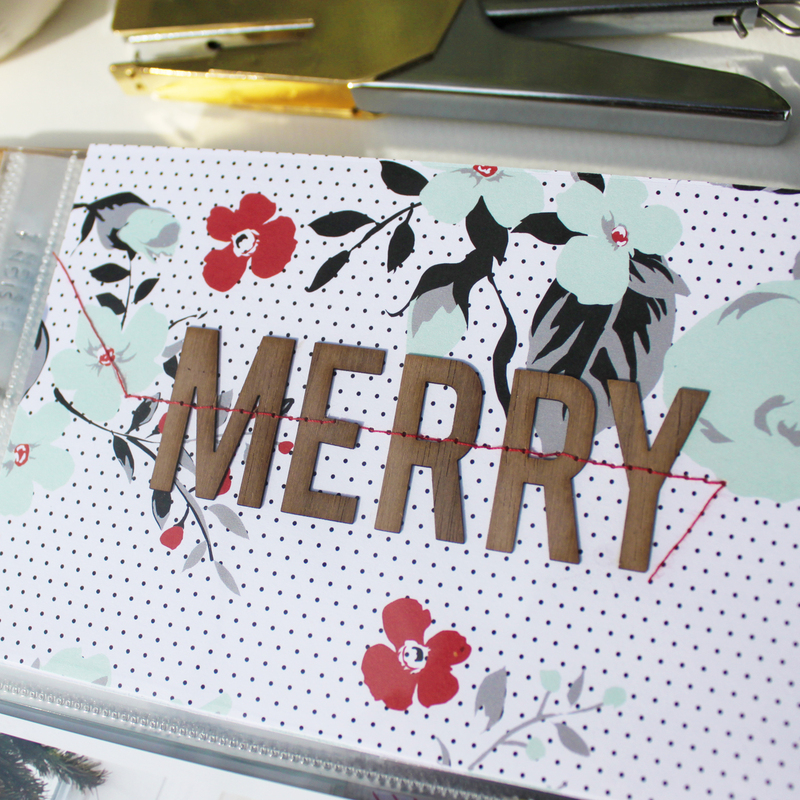 My final project I leave you with until the new year is one that I created using a sketch from Simple Scrapper, and Studio Calico featured it recently on their blog. 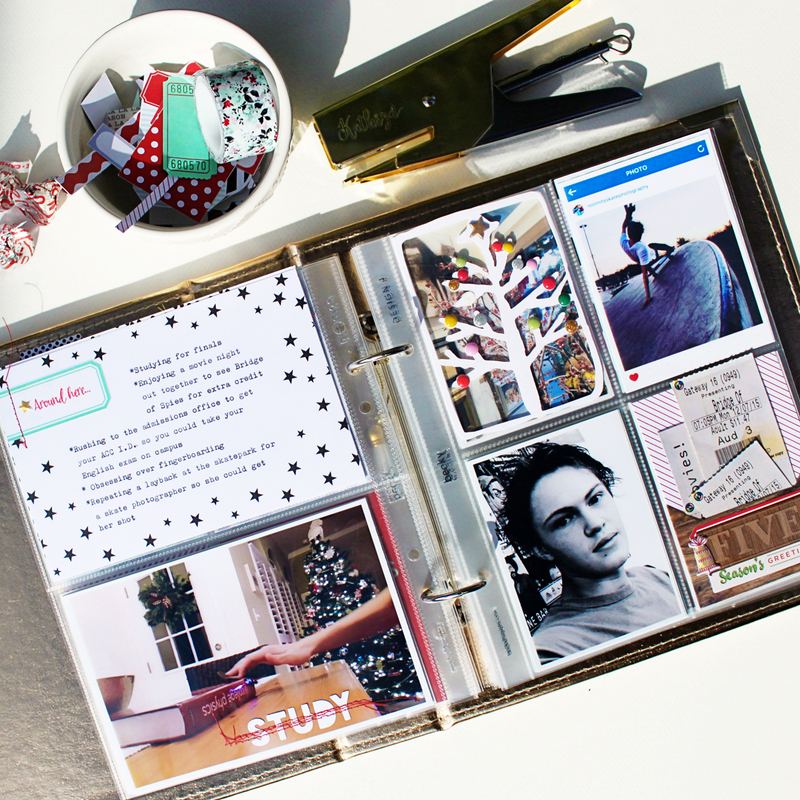 Doing Project Life has brought the awareness of capturing daily life as it is happening to my memory keeping. However, I recently realized that I am neglecting some of my older, special memories as most of my available creative time has been consumed with Project Life. Therefore, I am reconsidering the role of Project Life in my memory keeping going forward in 2016. The Story Starters™ available from Simple Scrapper are helping me to find and capture some of these neglected memories. 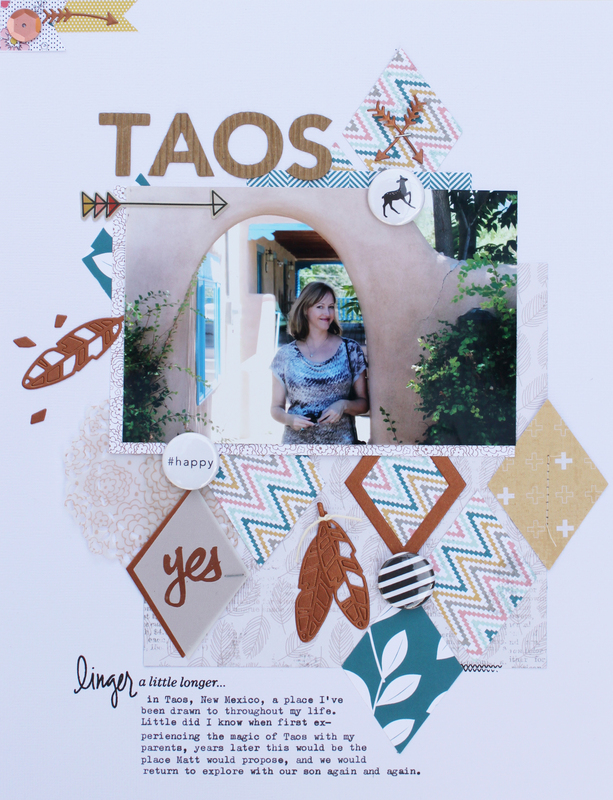 This layout tells about a place that refreshes my spirit, Taos, New Mexico. It is a place I have loved to visit throughout my life and is the place I got engaged 22 years ago. Yikes! Did I really just write that? I used the diamond nesting dies from Studio Calico and adapted a Simple Scrapper sketch to 9×12 to design this layout. The papers from Paislee Press Cedar Lane and Felicity Jane Savannah formed the color scheme. The metallic gold that is part of these two lines did not feel authentic to the Southwest, so I substituted metallic copper card stock which gave the layout an extra punch. There are several symbolic elements I placed throughout the layout, such as the crossed arrows symbolizing peace and the zigzag pattern representing the mountains. These elements help to tell the story about Taos, a town with strong Native American influence. Getting more of these past memories captured, such as this photo from 2012, is bringing me a deeper satisfaction lately. Do you have stories you wish to tell from days gone by? 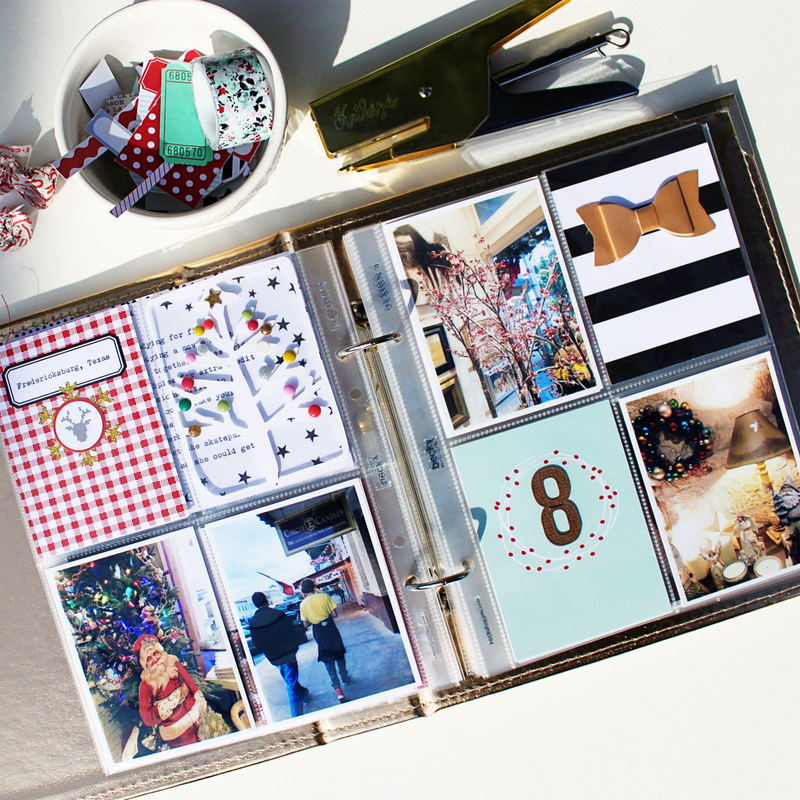 How do you handle balancing your daily memory keeping with capturing your enduring memories? All words and photographs on this website are my own unless otherwise noted. Please kindly link back to this site if you would like to use a photo. Thank you.